Okay, I haven't figured out how to make a video of Cary with my camera yet, but I did muster up the courage to turn the little dial from its permanent setting on AUTO to a new shooting mode--Fast Shutter: "For shooting fast moving objects." So while I don't have a mini movie of this priceless donkey moment (do you love that big white underbelly or what? ), I did get several more action shots. Click here to see them. This photo is actually the last one I took--right before (and this has never ever happened) the memory card announced that it was full! OH MY !!! OH MY !!! I nearly passed out from the cuteness. My mind can't handle it. Best photo ever !!!!! I thought maybe he was Rolling On The Floor Laughing! Awesome picture! Hahahahahahahaaaaaaa!!!!! Hilarious DDD photos! These are priceless! This rolling-in-the-dirt thing must be the same all through the animal kingdom; I have a hen and several outdoor cats who love a good roll in the yard. I guess it helps them scratch, or get rid of fleas? Adorable donkey! :) How many times do you get to say THAT? I have to say, I just found your blog and I think it - and YOU - are delightful. I'll be a regular visitor from now on. Oh my goodness! He certainly looks like he's having a good time! It makes me want to scratch him on his white belly like I do our dogs! Couldn't be better or cuter! My "aahhww" factor went through the roof! Wow, is Dan cute! Maybe someone's mentioned this in a previous post, or maybe you already know, but Jon Katz has a great series of articles on how he came to own and love donkeys at Slate. I haven't read the most recent article to the end, but his earlier ones were delightful. What kind of camera do you have? I make movies with mine simply by putting it on the movie setting and pressing down the shutter button (which stays down in this setting--action!). Then press it again to stop (cut!). You can even post them on your blog without having to anything but uploading them to a free service like blip.tv. which has a blogging feature. I hope you'll post a video of this darling guy too! It's been raining here and all of my horses have been rolling in the mud. they are not a pretty sight. Like a cat! O that Danny Boy! I have a donkey, too! That's why I'm visiting your blog for the first time. 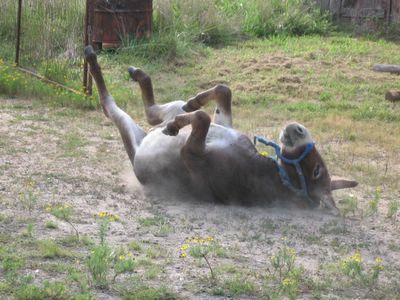 My donkey, Magnolia, does the same thing--especially after a period of rain, when the ground dries up, she gets on her back and gives it a good scratching in the dirt. I'm loving your blog; I only get to be a farmgirl part-time, so this is helping me get a daily dose. A donkey roll! I love it. But, that piglet, now. That's Babe, isn't it?